You can’t help getting excited about a destination when after a couple of hours, the wing of your plane dips and you plummet towards a stunning coastline guarded by towering limestone cliffs. A manoeuvre which also provides you with the most tantalising glimpse of fantasy like islands dotted amongst unbelievably vivid blue water. This was my introduction to Croatia. And the enchantment continued with the warm air that enveloped me as I was invited to disembark into a building not much bigger than a small regional airport. A refreshing change from the sprawling labyrinths of larger city airports. And certainly more efficient. Split, it turned out, is a fantastic location for a short city break. Already served by the budget airlines, it is quick and easy to reach. It also boasts an almost perfect temperature for sightseeing in the autumnal offseason. 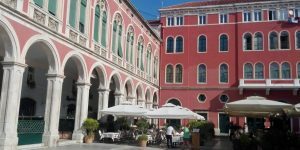 Its central attraction is Diocletian’s Palace. But it’s not the normal stuffy heavily guarded type of palace. Over 3000 people live within its shadow. Shops, apartments and restaurants have cleverly woven themselves into its ancient walls, to keep it accessible to all. Built for the Roman Emperor of the same name, the Palace dominates the old town and lends its unique character to the city. Amazingly it is still free to meander along its timeworn, glossy flagstones, amongst irreplaceable ruins that are thousands of years old. The tangle of age-old narrow streets lends themselves perfectly to adventure at every corner. And the occasional encounter with a Roman soldier. With so many twists and turns, museums, art galleries, shops and cafes to discover, it is easy to miss a few. If you ever tire of traversing the colonnades and markets, which lay outside its walls, there is the port. And the promise of further adventure on the nearby islands. Endless opportunities to dive into crystal clear waters, sip delicious local wines at cliched tavernas, and sprawl on empty beaches are just a few short ferry rides away. Excursions to Solta, Hvar, Brac and Trogir are as easy as getting on a bus. Coming up….where to eat in Split? Previous Fancy a European road trip?